Paul's first encounter with vegetarianism was in 1967, when the Beatles became followers of the Maharishi Mahesh Yogi. They were all vegetarian for a while at the Maharishi's ashram in India, and it seems that Paul continued for a while on his return. But he was eating meat again by the time he married Linda in 1968. 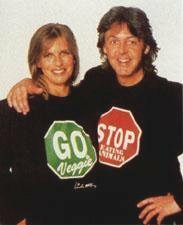 England, December 6, 1999 - In honor of the significant contribution that Lady Linda McCartney made to the cause of vegetarianism, the International Vegetarian Union awarded her posthumously the Mankar Trophy. 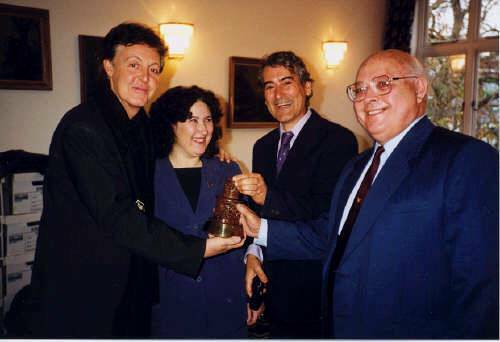 Her husband Sir Paul McCartney happily accepted the original Mankar Trophy along with a replica that he will keep. In 2002 Sir Paul donated some funds to the Vegetarian Society UK to enable participants from developing countries to attend the IVU World Vegetarian Congress, being organised by VSUK in Edinburgh, Scotland. Some leaders of African vegetarian societies were thus able to attend.